Ken Block and his Hoonigan Racing Division are currently practicing for the second stop of the 2013 Rally America Championship in Salem Missouri and while practicing in his newly designed Ford Fiesta race car ahead of the 100 Acre Wood Rally, Block invited Navy veteran and quad amputee Taylor Morris on what was surely the ride of a lifetime. For those who are unfamiliar with Navy veteran Taylor Morris, he is a quad amputee who made a video with the help of his friends late last year calling out Ken Block for his skills – going so far as to show how much better he could do in his own car on some snowy roads. At the end of Morris’ Ken Block-like video complete with jazzy background music, a ton of different camera angles and lots of slow motion, the video asks viewers to tweet the video link to Ken Block in an effort to get Morris a ride along with the head Hoonigan. The video of a quad amputee drifting around in the snow with his Mazdaspeed6 quickly went viral – eventually catching Block’s attention. You can check out the original video below. After seeing Taylor Morris’ video and hearing his story, Ken Block offered to let Morris come to the 100 Acre Wood Rally for a chance to ride shotgun in the Ford Fiesta rally car – a ride that took place yesterday. Ken Block has become one of the world’s most recognizable public figures with his name spreading from a variety of rally racing venues to the X Games to the shoe world where he serves as president of DC Shoes. Even though he is likely very busy with the ongoing rally racing season, Block found the time to host Taylor Morris and his buddies who helped him make the original Mazdaspeed6 Hoonage video at the course in Missouri where Ken strapped Morris into the DC Shoes/Monster Energy Drink Ford Fiesta race car for what was surely an exhilarating experience. Some quick background information on Taylor Morris and how he came to be a quad amputee. Taylor was a member of the Navy’s Explosive Ordinance Disposal team where he was trained to handle and disarm high explosives. After training and being stationed in Virginia Beach, Morris was deployed to Afghanistan where he was expected to serve from January 2012 through August 2012 but on May 3rd 2012 – Morris was seriously injured by an Improved Explosive Device (IED). The result of the blast required doctors to amputate Morris’ right hand, his left arm from the bicep down and both of his legs. However, after just 8 months of rehab, Morris was well enough to make the awesome Hoonage video shown below. 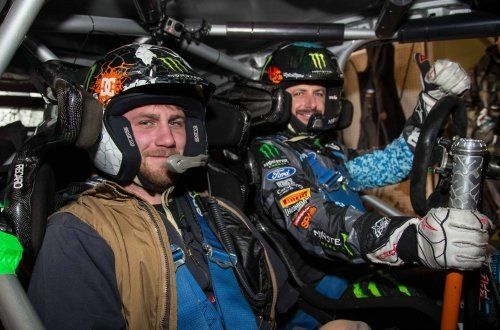 As a result of his determination to not let his war injuries slow him down, Taylor Morris was able to attract Ken Block’s attention and in doing so – he got to experience a ride through the 100 Acre Woods in Block’s rally car. Click here for more on the life of Taylor Morris. On the behalf of everyone at TorqueNews, I would like to both extend my appreciation for Taylor Morris’ sacrifices while also applauding Ken Block for taking time out of his schedule to provide an American serviceman with an unforgettable experience. With any luck, the Hoonigan Racing Division will offer up a video of Morris’ ride along with Ken Block but in the meantime, enjoy the video below that Taylor made to get the attention of Ken Block and his team. For Ken Block and his team, they are back to business as they all prepare for this weekend’s 2013 Rally America race at 100 Acre Woods. Check back for results of this weekend’s rally action!